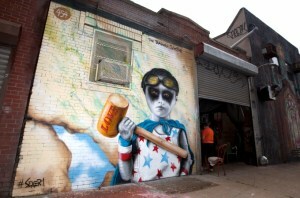 But after losing his mother to a brain tumor in 2011, a devastated Ficalora threw a neighborhood party the following year to raise money for children with brain tumors, and asked some prominent street artists to paint a few local walls. 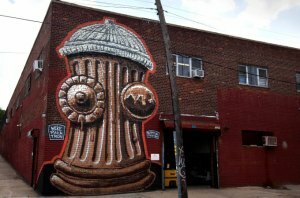 This evolved into the Bushwick Collective, Ficalora’s landscape-changing effort to turn Bushwick into a diverse, massive outdoor art gallery. 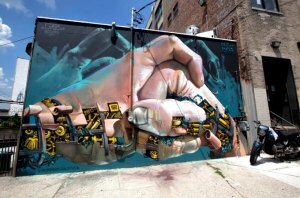 “When I see something I love, and I see how the artists live their lives,” says Ficalora, who refers to himself as an “accidental curator,” “I’m inspired by it.” This is his Bushwick street art New York. Many artists, like rappers, work under invented monikers. This work was a one-day collaboration between six of them. The artists on this collaboration knew each other solely by reputation. 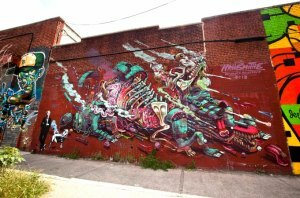 Ficalora introduced them and they had one day in town together — Nychos is from Austria, Smithe from Mexico — so they decided to create this. This entry was posted in News on October 27, 2014 by lul-admin. 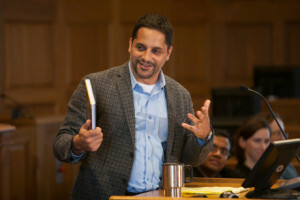 Eduardo M. Peñalver ’94, an expert in property law and land use, and Cornell faculty member from 2006 to 2012, has been named the next Allan R. Tessler Dean of Cornell Law School. Currently the John P. Wilson Professor of Law at the University of Chicago Law School, Peñalver will become dean July 1. Peñalver succeeds Stewart J. Schwab, who has been dean since 2004. Schwab, a faculty member since 1983, plans to return to teaching at the Law School after a sabbatical in the 2014-15 term. “Eduardo’s extraordinary academic pedigree, deep love for Cornell, personal warmth and engaging vision make him ideally suited to build upon the excellent work of Dean Schwab and to further advance the pre-eminence of the Law School,” said Provost Kent Fuchs. Peñalver, who received his B.A. from Cornell’s College of Arts and Sciences in 1994 and his law degree from Yale Law School in 1999, joined the Cornell faculty in 2006 and the Chicago faculty in 2013. He taught at Fordham Law School from 2003 to 2006 and has been a visiting professor at Harvard and Yale law schools. Upon completing law school, he clerked for Judge Guido Calabresi of the United States Court of Appeals for the Second Circuit and for Supreme Court Justice John Paul Stevens. Between college and law school, Peñalver studied philosophy and theology as a Rhodes scholar at the University of Oxford. Praised by colleagues as an important, passionate and brilliant scholar, Peñalver has had his work on property law published in scholarly law journals at Yale University, the University of Michigan, Cornell and the University of Pennsylvania. He is considered to be a leading voice in the “progressive property” movement. His research explores how property law creates or reinforces communal bonds and how property rights mediate the relationship between individuals and communities. Peñalver’s book “Property Outlaws” (co-authored with Sonia Katyal), published by Yale University Press in 2010, explores the role of disobedience in the evolution of property law. His most recent book, “An Introduction to Property Theory” (co-authored with Gregory Alexander), was published by Cambridge University Press in 2011. Described as an eloquent, engaging and provocative instructor, Peñalver has taught courses on land use, law and religion, property law, and theories of property, among others. In addition, he has delivered more than 60 academic presentations all over the world. From 2009 to 2011, Peñalver was director of faculty research at the Law School. From 2007 to 2010, he was faculty adviser to the Cornell Law Review. 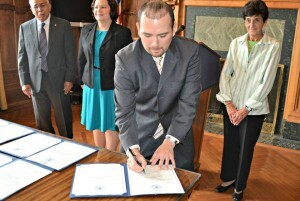 In 2010, Peñalver received the Provost’s Award for Distinguished Scholarship. Peñalver and his wife, Sital Kalantry ’94, met as undergraduates at Cornell. She will be returning to the law school as a clinical professor; currently Kalantry is a clinical professor at the University of Chicago Law School and founder and director of its International Human Rights Clinic. Together they have two children. This article originally appeared on http://www.news.cornell.edu. This entry was posted in News on March 16, 2014 by lul-admin. A University of Virginia student is being called, a role model, mentor, and hero. In this week’s Stephanie’s Heroes, CBS19’s Stephanie Satchell is featuring David Tinta, who’s mentoring children in Albemarle County. He’s helping them with school work and boosting their confidence. David Tinta is a busy 4th year student at UVA but still finds enough free time to give back in between classes. Once a week, he volunteers in the Southwood community in Albemarle County. “These kids are just looking for someone to give out a hand and to help them out in their time of need. This is the time to enlighten themselves and feel excited about education and I just want to be a part of that,” said David Tinta. Tinta is a member of the Latino Student Alliance at UVA. 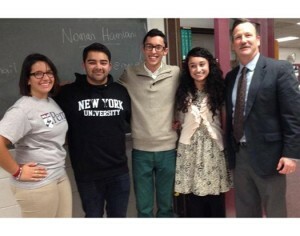 Members of the organization mentor and tutor children in the primarily Hispanic community. “We saw a need. There were so many children in the Southwood neighborhood that come to Cale school that needed extra help,” said Gloria Rockhold, Community Engagement Manager, Albemarle County Public Schools. Tinta spends most of his time reading and working on math problems with 1st grade student Brayan Chico Esteban. “The best part about working with David is that at the end, we get to do another homework and play games,” said Chico Esteban. Tinta says it’s important for him to be a role model to children here. “I would look to the television and see people just like me doing successful things like going to college and being a lawyer or whatever it might be. As a child, I never found these role models and I felt that because i’m going to college and because I’m in the place that I am, that it’s my duty to go and be a role model to these kids,” said Tinta. Cale Elementary School principal Lisa Jones says the mentoring program is making a big difference for lots of students. “When students get any extra support at home, it’s going to show in the classroom. If you are coming in the classroom ready to learn, you are more confident. So, any help that you can get outside of school, I feel that it’s going to have a positive impact on how you perform inside of school. 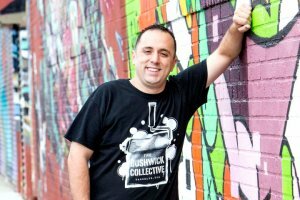 Although David Tinta doesn’t think “hero” is the right word to describe him, many others in and around the community do. This article first appeared on http://www.NewsPlex.com. This entry was posted in News on February 25, 2014 by lul-admin. Los panelistas y ex alumnos de Brentwood: Ashley Crespo, Noman Hamlani, William Genova, Elissa Olivera y Richard Loeschner, director de la Escuela Secundaria de Brentwood. ¿Porqué solo unos pocos estudiantes que se gradúan de la Escuela Secundaria de Brentwood continúan con sus estudios universitarios? La respuesta a esta pregunta la encontró William Genova durante su primer año de estudios postsecundarios, cuando se dio cuenta que conocía muy poco de los recursos que la universidad a la que asistía ofrecía. Él, como muchos otros estudiantes de su escuela secundaria, apenas había recibido información relacionada con los estudios universitarios. Genova, de 20 años, estudió en el distrito escolar de Brentwood desde el kínder hasta su graduación en el 2011. Actualmente el joven de origen puertorriqueño estudia Estudios Étnicos y Educación en la Universidad Yale. Aunque en la escuela secundaria de Brentwood ofrecen programas y eventos para que sus estudiantes continúen con sus estudios universitarios, la información proporcionada es muy básica, por lo que no promueve ni concientiza a los estudiantes sobre la importancia y el valor de la educación universitaria en sus vidas. Con el fin de cambiar las cosas, Genova creó la iniciativa “Rise Up Brentwood” o “Levántate Brentwood” cuyo objetivo es cultivar la importancia de la educación universitaria en la comunidad de Brentwood, a través de la facilitación de discusiones en torno a diversos temas de educación. Mediante asambleas, debates y paneles, ex alumnos de Brentwood que atienden diversas universidades en el país comparten sus experiencias y cuentan los obstáculos que han librado, con el propósito de motivar a los jóvenes a luchar por sus sueños y continuar con sus estudios. Varios de los panelistas son los primeros miembros de sus familias que van a la universidad, otros son inmigrantes, o trabajan desde muy jóvenes para ayudar con la economía de sus familias. Esto hace que los estudiantes se identifiquen con ellos y se den cuenta que existen mejores oportunidades, depende de ellos mismos aprovecharlas. “Les contamos lo satisfactorio que es ir a la universidad y que es una oportunidad que ellos también pueden tener”, dijo Genova. Esta iniciativa también ofrecen un programa después de la escuela para ayudar a los estudiantes a aplicar a universidades especiales. “Aunque estas universidades son altamente competitivas, cuentan con los recursos y la ayuda financiera que muchos de estos jóvenes necesitan. Buscamos que los estudiantes piensen de manera diferente, para que tomen el control de sus vidas a través de su educación”, enfatizó. Genova considera que la información sobre educación postsecundaria debe proporcionarse a los alumnos desde más temprana edad, por ello compartirá este programa con los estudiantes de la escuela media de ese distrito escolar. This article was originally posted on http://noticiali.com/. This entry was posted in News on February 9, 2014 by lul-admin. Hermano TJ Carrizales was recently sworn in to Yonkers Mayor Spano’s Hispanic Advisory Board as a part of an initiative called Strive that tracks children from their early years to college graduation. This entry was posted in News on December 10, 2013 by lul-admin.